Over the years I have heard many reasons why parents hesitate to bring young children before the Eucharist each week to adore Jesus. Among these reasons are that they are too young to sit still, or that they won't understand what is happening. Some feel that it is hard enough to get them to be attentive at Mass, and if they add another hour on Sunday, how can they expect them to behave? Well, I remind them that Jesus Himself told us, Let the children come to me and do not hinder them; for to such belong the Kingdom of Heaven. (Matthew 19:14) And, that our Holy Father, Pope John Paul II, has made this request, I urge priests, religious and lay people to continue and redouble their efforts to teach the younger generations the meaning and value of Eucharistic adoration and devotion. (from the Vatican, 28 May, 1996) So, how else can we respond than to bring children to the Eucharistic Heart of Jesus! Children who previously had only the weekly experience of Mass, discover that the Host is actually the person of Jesus, mysteriously hidden. They develop a greater interest in the mysteries of our Faith and the liturgy of the Mass. They understandmore than other children of their age who have not experienced Eucharistic Adorationthe relationship between the gift of the Eucharistic Presence of Jesus and His sacrifice on the Cross out of love for mankind. They become much more aware of the various degrees of sin and seem very eager to receive the sacrament of Confession often. Families accompanying their children witness a growing desire for peace and forgiveness within the family. When children become friends with Jesus, by spending time with Him, do they not become living signs of faith in Jesus' Real Presence in the Eucharist for those who doubt, and therefore also become wonderful signs of hope for those who despair in finding God on earth? Ask your pastor if he would agree to watch the video on children's adoration. When you begin the hours you will want to be prepared. General norms for the worship of the Eucharist are found in Holy Communion and Worship of the Eucharist Outside Mass, published by Catholic Book Publishing Co., © 1976. It is important that those who plan a children's Holy Hour be familiar with the teachings and rubrics of this ritual text. You can use the manual that we have prepared or design your own format. And for parents especially, from morning to evening you go through all kinds of activities. There is so much going on around your homes. Are you sometimes too busy to stop and drive your children to the Adoration chapel? Or, maybe there is no access to a perpetual adoration chapel? This is a good reason to develop a Spirit of Adoration in your children. The Virgin Mary lived in this spirit of adoration in her home in Nazareth. Whether she was cooking, cleaning, helping around her community, whatever she was doing, throughout all her activities she was always adoring God. Why not start to develop this spirit of Nazareth, this spirit of living in the presence of the loving gaze of the Father at all times in your children? You can begin teaching your children this at such an early age. 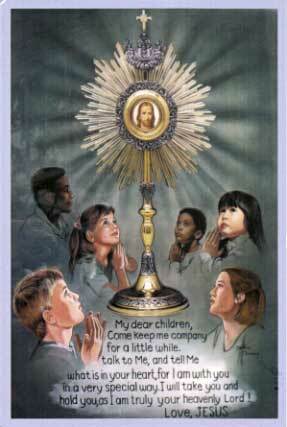 Teach them to make acts of adoration all throughout their day. Begin first thing in the morning as soon as they awake. Make this act of adoration together, My God, I know you are with me as I begin this new day. You are always with me, watching over me in all things, I adore You. Then throughout the day continue to make these short acts of adoration, drawing your hearts and mind briefly into the presence of God. Offer to Him the adoration He deserves. Bl. Elizabeth of the Trinity had a deep desire to enter the Carmel. For 6 years her parents refused to give permission and so she made her bedroom a little Carmel. How pleased Our Lord would be if you could teach your children to do this. Help them to make a small corner in their rooms for prayer. You will see how much fruit will come from this over time. And so dear people, please learn to encourage children to live in this spirit of adoration at all times, both in the presence of Our Eucharistic Lord and in the everyday activities of life, living in the spirit of Nazareth with Mary. May Our Lord bless you through the intercession of Mary, Mother of the Eucharist. "Join Fr. Antoine as he leads a lively discussion group with children on the topic of Eucharistic Adoration."